By Erny ZahLocal FM radio listeners this week started hearing some unusual sounds at 94.5 on the dial--Navajo-language broadcasts. 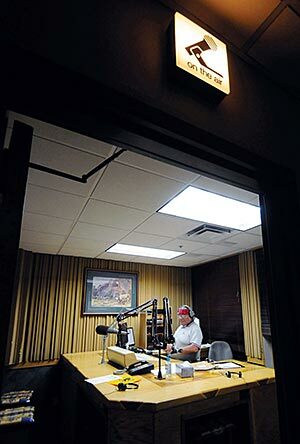 Last Saturday, KYAT became the only FM station known to be dedicated entirely to speaking in Diné bizaad.And:Malti and disc jockeys Eugene Plummer, Buddy Lee and Roy Keeto, collaborated to put together a Navajo-language station that has a broadcast philosophy based in traditional Navajo teachings. Rather than a linear plan, they envision a circular structure with goals to achieve along the way until they have achieved the creation of an enduring community resource to reach and uplift listeners. More than just music and announcements, Malti said he plans to incorporate history, stories and information that gives a picture of Navajo life, both contemporary and traditional. By Tesina JacksonAfter translating English words into Cherokee for many projects in the past few years, the Cherokee Nation language technology group decided to use those translations by creating Google Maps using the Cherokee syllabary. “Other projects that we’ve done we’ve had to do a lot of countries and we figured that one of the reasons we wanted to do this is because we were doing so many different localizations for different projects and we were ending up with a large database of country names,” said Joseph Erb, language technologist. “We wanted to figure out a way to actually put this out there where people could see it and look at things and we wouldn’t just have the data on a couple of computers somewhere. We could actually put it out and the community could go to it and find out different names for things or see a map in the language.”Comment: For more on Cherokee, see Cherokees Mourn Steve Jobs and Webcomic on Cherokee Language. Below: "Creating a map on Google Maps allowed the language technology group to add places and points of interests and even upload videos providing information on that location in the Cherokee language."